GLARE PROFESSIONAL PLUS + POLISH will make your vehicle.s paint shine so bright that you will literally need sunglasses to look at it during the day, Now With More Glassplexin for more Protection !and it will look luminescent under artificial light at night. This product provides the highest shine available with a three dimensional depth of gloss not achievable with any other product. This is brand new technology in paint appearance and protection. 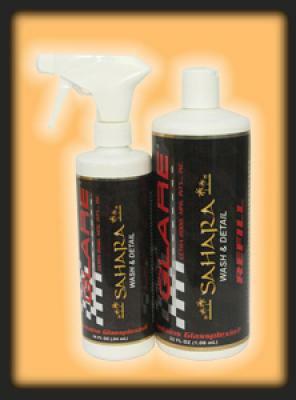 GLARE PROFESSIONAL POLISH is a non-stick, high gloss, all-weather, temperature- flexible sealant containing a new type of proprietary chemical formulation called Glassplexin. GLARE was developed by on- staff chemists who have over 150 years of paint-specific chemical experience combined. 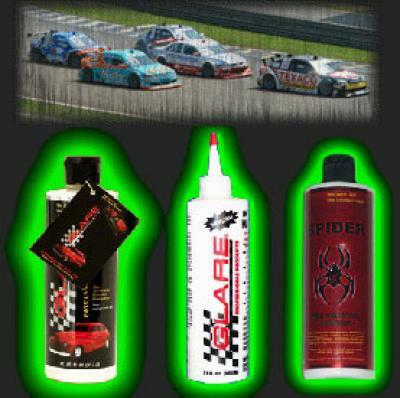 GLARE PROFESSIONAL POLISH represents the very latest in paint appearance and protection technology. It contains no waxes, polymers, or resins because those type of ingredients and chemicals have very low melting points, do not filter out UV rays, and do not hold up to regular washing. GLARE PROFESSIONAL POLISH will bond to your vehicle.s paint through a covalent chemical bond which is not possible with any other product currently available in the world.s market. The chemical reaction that occurs between GLARE and the paint literally transforms the chemical structure of the vehicle.s paint to now share the properties of both the original paint and glass. Micro scratches, swirls, and oxidation are all removed permanently. The end result is a newly created type of paint/glass hybrid .SUPER PAINT. that is harder and more resilient then before. The GLARE treated paint has a much higher surface tension and causes water to sheet off instead of beading. The newly chemically altered paint now has the ability to filter out over 98% of the sun.s UVA/UVB rays, the ability to block out air oxidation and corrosion, the ability to expand and contract with temperature variances up to 650 degrees Fahrenheit and down to negative 250 degrees Fahrenheit without cracking fading or peeling, will hold up to regular washing, and will block damage from everyday environmental contaminants that always seem to find their way onto your vehicle. Bugs, bird droppings, and tree sap will not stick to paint treated with GLARE. 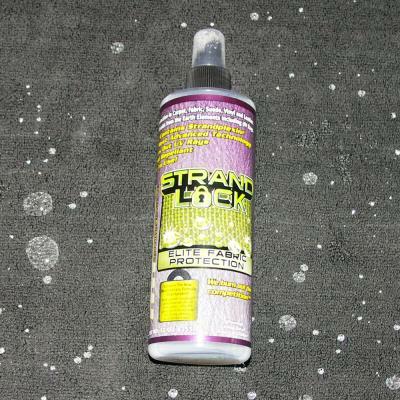 Also, GLARE PROFESSIONAL POLISH creates a paint surface so smooth and slick that the Air-Drag Coefficient of your vehicle will be significantly reduced, actually making your vehicle more aerodynamic. GLARE provides all of these benefits while producing the highest three dimensional depth of gloss never before achievable, and this is why GLARE is not only used by individual enthusiasts and collectors, but also by vintage car and motorcycle museums and the world.s most famous professional custom car and motorcycle painters in the industry. 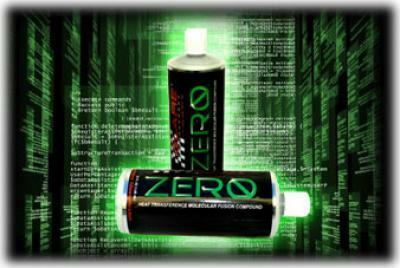 This is the absolute finest gloss enhancing polish/sealant currently available in the world.s market for your car, truck, motorcycle, ATV, boat, yacht, personal watercraft, R/V, motorhome, trailer, or aircraft. Never apply carnauba wax, or polymer synthetic wax, on top of your final GLARE coat as this will adversely affect the chemical bonding process with the paint and will cause the shine to go down. There is no need to top GLARE with anything else because GLARE provides the highest shine of any other product available. This should always be the final step in any application. 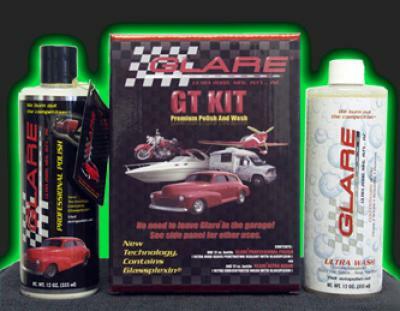 GLARE PROFESSIONAL POLISH has been developed to be able to work on a wide variety of car, motorcycle, boat, and aircraft specific paints including Acrylic Enamels, Urethanes, Polyurethane and Polyurethane Clearcoats, and epoxy or polyester resin Gelcoats. GLARE PROFESSIONAL POLISH has been tested and approved by BOEING for use on PPG Aircraft Paint. 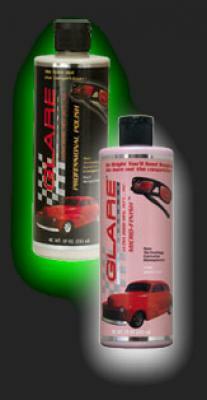 Glare can be used on Fiberglass, Carbon Fiber, Glass, Plexiglass, Plastic, Chrome, Aluminum, and all metal alloys. 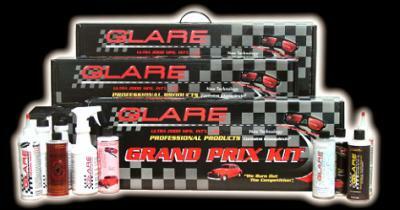 GLARE is also excellent for exhaust pipes, wheels and rims, headlights and brake lenses, helmets, visors, goggles, eyeglasses and sunglasses, household appliances, marble, tile, porcelain, finished wood, brass, silverware, gold, jewelry, windows, mirrors, crystal, sporting goods, golf clubs, skiing equipment, water sports equipment, musical instruments, and repairs CD.s and DVD.s. 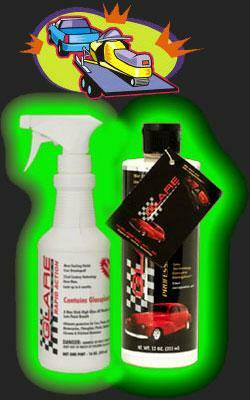 As you can see, GLARE does not need to be stowed away in the garage after you.re done treating your car or bike. It can be used around the house and on almost anything and everything that you own. If you think your paint looks good now, just wait until you see it after it has been GLARE.D. You.ll be seeing your vehicle.s paint in true HD for the first time in your life! GLARE PROFESSIONAL POLISH. Beyond wet. GLARE Professional Polish Shines so bright, you'll need sunglasses! A non-stick high-gloss all-weather sealant. The finest polish for your car, airplane, boat, motorcycle, glass, stainless steel, fiberglass, chrome, Carbon Graphite, and RV in the world's market. Filters out UV Rays, turns to glass on and within your paint. Contains Glassplexin®. Bonds molecularly to your paint. The most revolutionary polish ever developed. Beyond 22nd century technology. Lasts up to five years. GLARE Micro-Finish "We burn out the competition." A non-stick high-gloss all-weather sealant that lets paint breathe. Contains Glassplexin ®. 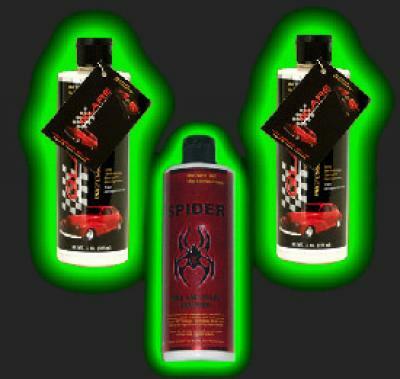 Ultimate scratch and oxidation removal for Cars, Planes, Boats, Motorcycles, Fiberglass, Plastic, Stainless Steel, Chrome & Polished aluminum. For use with GLARE Professional Polish.